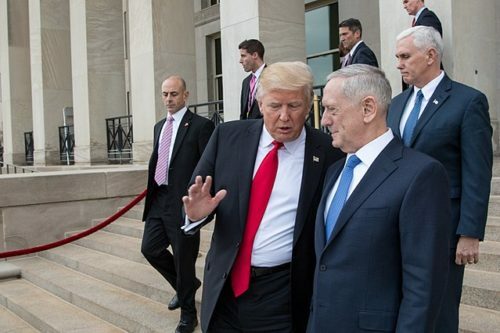 Defense Secretary James Mattis has reportedly forwarded his recommendations on transgender soldiers in the military to President Donald Trump, seven months after he attempted to ban them via tweet. While the details of those recommendations remain unknown, the Washington Examiner has said officials confirmed they have been sent, as the White House had previously said would take place today. The White House will take the recommendations into consideration, and then make the final decision on what the policy should entail. While we wait, let’s take a look at how we got here. On June 30, 2016, the Pentagon announced it would end its ban on transgender people serving in the military, to take effect October 1 of that year. The Trump administration signaled early that it would not take the same approach to the issue of trans people in the military in the same way as the Obama administration. Each branch of the military was supposed to come up with a plan for recruiting openly transgender people by July 1, 2017. Instead, the Pentagon announced that it would delay enlistments for another six months. Since the president cannot rule by fiat via tweet storm, this only further complicated the issue, setting off a legal showdown. An opinion poll conducted by Reuters shortly after Trump tweeted out his supposed ban showed that most Americans did not agree with his position. 58 percent of adults agreed with the statement, “Transgender people should be allowed to serve in the military,” and only 27 percent disagreed. Admiral Paul Zukunft, the Commandant of the United States Coast Guard, came out against banning transgender people from the military on August 1, while speaking the Center for Strategic and International Studies. He said he would “not break faith” with trans service members. He personally reached out to the 13 Coast Guardsmen that have self-identified as transgender when the news broke that the Trump administration was targeting them for discrimination. 56 retired generals and admirals came out against the ban on the same day as Zukunft made his comments. Navy Secretary Richard V. Spencer also pushed back. Former Army secretary Eric Fanning said he worried that the ban would result in transgender people facing harassment. “The military is a very professional organization. It’s also a very young organization. And here the commander-in-chief is essentially saying it’s okay to discriminate against this group of people. So I worry about how that message is being received, particularly by young people in uniform. And I worry about the environment that creates for open trans service members,” Fanning, the country’s first openly gay Army secretary. Five active duty transgender service members filed the first lawsuit against the transgender military ban in early August. That was just the start, as two more lawsuits followed, bringing the total to three different suits filed in federal court against the Trump administration over its ban. Meanwhile, a legislative attempt for a bipartisan effort through the amendment process to stop the ban, brought forward by Senators Kirsten Gillibrand and Susan Collins, was blocked from getting a vote. The Trump administration has so far fared poorly in the courts. U.S. District Judge Colleen Kollar-Kotelly ruled in late October that the transgender military members who have filed suit are likely to win their case, and so barred the Trump administration from changing policy in the meantime. The administration filed an appeal on November 21, the same day a second federal judge blocked the attempted ban. It would go on to lose that appeal. U.S. District Judge Marvin Garbis said transgender people serving in the military have “demonstrated that they are already suffering harmful consequences,” since the president first tweeted out news of the change in policy. Garbis’ ruling went a step further, preventing against the blocking of funding for gender confirmation surgery. Earlier in the month, the Pentagon agreed to pay for an active-duty transgender soldier’s gender confirmation surgery, the first such procedure approved under a waiver. The administration filed for an emergency stay in December to try to delay the court order by Kollar-Kotelly that instructed the military to allow trans soldiers to enlist beginning on January 1. Despite its best efforts, the Trump administration finally accepted that it would have to allow trans soldiers to enlist beginning on January 1 of this year. The administration is not rolling over, however. It has continued to fight for the ban. Earlier this month, it said it would not be turning over information relevant to the case, as it would be unveiling and defending a new policy regarding transgender soldiers. Garbis revealed the administration’s plans in a a brief ruling on when the government was required to turn over that information. ABC reports that the Pentagon confirmed today that it would make the recommendations available sometime this week.